Getting up in the morning is tough enough as it is, and if you’re someone who cherishes every extra second in bed, the idea of an arduous grooming routine is enough to make you hit the snooze button. Though, choosing to neglect your skin will leave it looking tired and dull and eventually, even sleep won’t save you. If you’re a creature of habit, you’ve probably got the same shampoo you’ve always used, it’s most likely the one that’s permanently on offer; a basic formula to strip grease and pump a fist load of fragrance into your hair. Maybe you’re the sort to use an all-in-one face, hair and body wash – each to their own. To this end, we have rounded up the products you need to save you time in the morning, and delay the signs of time in your face. With the right tools in your arsenal, you can shape-shift your makeshift attempt at grooming into an easy, effective habit that you can do on auto drive. It’s time to shake up your wake up. Time to ditch the £1 all in one; the skin on your scalp requires a little TLC like the rest of you and it needn’t take you much time. Whilst the basic stuff is great at doing the basics – stripping and cleaning, you need something to cleanse, balance and nourish your scalp. Ideally, keep washing to every other day if possible, so not to dry out your hair and scalp too much. Put in more than you take out. Washing your hair everyday also strips it of its natural oils so shampooing every other day is recommended. If you’re a slave to hair wax and have to wash every day, then Windle & Moodie’s everyday shampoo is formulated with antioxidants - namely C, E and green tea and a perfect option for daily and every other day washes. It’s also designed to slow the process of hair loss and thinning, should that be an area of concern. When it comes to your pits and bits, you want something gentle that will cut through deodorant and leave you smelling fresh. Word to the wise: Mint body wash always sounds like a good idea at the time… though it’s certainly one way to effectively wake yourself up. A delicate balance of scents, you’ll find no sickly sweet, artificial fragrance here. Molton Brown isn’t laced with surfactants to compensate for poor formula and it lasts ages. It’s gentle, effectively cutting through deodorant and body odour. Plus, it’s moisturising and we’ll take as much of that as we can. Are you washing your face with soap and wondering why your face shines rather than glows? Body wash, bars of soap and shampoo are not to be used on the fragile surface of your face, sure, they clean, but they strip it of natural oils and dry it out, sending your sebaceous glands into overdrive - you’ll be a crude oil gold mine. The luxury lather of Institut Esthederm’s deep cleansing facial wash will leave you feeling like you’ve done your skin a favour. It’s a gentle polish that leaves your skin feeling soft, rather than sapped of moisture, keeping it nicely balanced. The satisfying, creamy lather makes this a good option for beards, too. 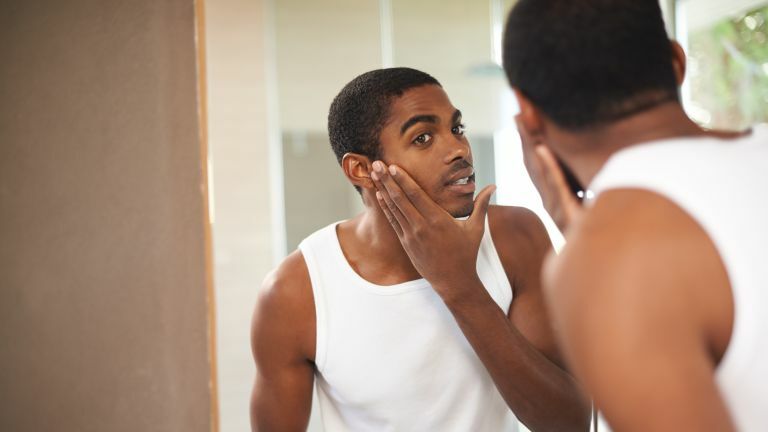 If you wet-shave daily, do it post-shower, when your face is clean and your pores are open. Bear in mind, dragging a razor across your face daily can leave skin looking affronted; there’s nothing gentle about metal on skin. The key ingredients to rescue aggravated skin are tea tree and witch hazel, which minimise irritation and ingrown hairs. Another miracle potion from Aesop, it’s slick texture is perfect for a close shave; formulated with glycerin to give your razor enough slip. This serum is lightly fragranced with added Panthenol to moisturise and soothe – it’s a pleasure to apply. Get yourself one that does both. Clinique’s SPF moisturiser is no-frills and fast absorbing with the prevailing protection of SPF, a winning option for all skin types. Because no one likes the smell of dog breath in the morning. Teeth, tongue and gums need a gentle scrub with a minty fluoride-based toothpaste to prevent you from offending anyone. Top tip: hold off on the mouthwash until later in the day, as the fluoride in toothpaste is more effective than that in mouthwash. This toothpaste is an all-rounder, offering protection by way of potent fluoride, it will tackle plaque, staining, gum disease and help to prevent cavities. Whilst you’re at it, check out the best electric toothbrushes for 2018 to keep you on the right track.